Traditional healer Arnaldo Rodis (45) gives a spiritual consultation to the 32 years old woman Kadija Salimo Giva, who came from Maputo to ask witchdoctor’s help in happy marriage. Madamba village, Tete province. In Mozambique, traditional healers are more popular than professional doctors. 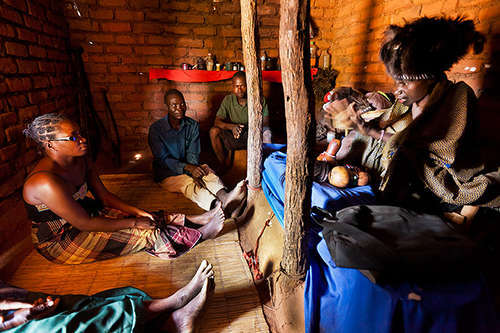 All witchdoctors are members of AMETRAMO – Association of Traditional Medics of Mozambique, which brings together practitioners from across the country and issues them a license to “doctor” activities. To help people, healers call upon spirits, who enter their bodies for a short time during a given session. After a session, doctors give patients compounds of dried herbs and roots, or take their patients through a variety of “wellness” ceremonies, such as bathing in goat’s blood or making special cuts with a razor blade all over the patient’s body.